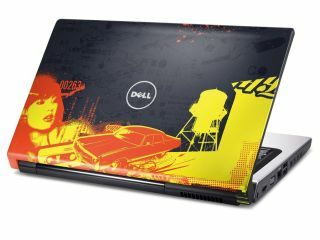 Dell has marked its sponsorship of this year's MTV Europe Music Awards by releasing a 'Filth' special edition laptop, and apparently that's nothing to do with returning host Katy Perry. The Dell Inspiron 15 has been given a working over by urban artist Filth and allows one free album download from the Dell Download Store (woo!). The specs of the machine are: Intel Core 2 Duo (T6600) processor, 15.6-inch screen, 320GB hard drive and 4GB of DDR2 RAM. The laptop is available through dell.co.uk/mtv and weighs in at £479 – unfortunately Perry is not included. Dell is also running a competition at Amplichoir.com where anyone uploading a video of themselves singing Lollipop can win a VIP trip to Berlin for the EMAs.